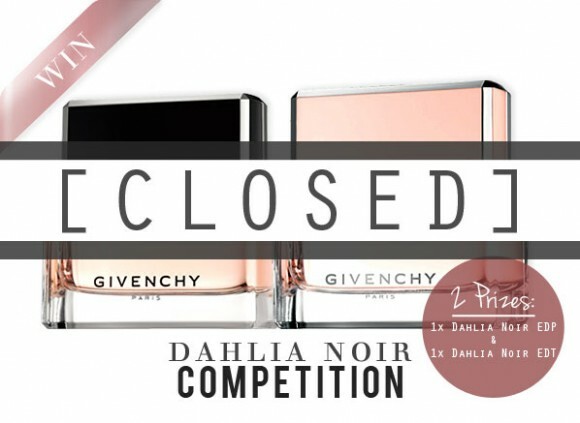 Inspired by the elusive black dahlia bloom, Dahlia Noir, the brand new fragrance collection from Givenchy, is characterised by its mystery. The range is bathed in darkness and light, danger and delicacy, featuring a deep and voluptuous Eau de Parfum, and a radiant Eau de Toilette. The Dahlia Noir Eau de Parfum opens with the softness of mandarin and mimosa, before a spicy pink pepper note enlivens the composition. A heart of rose, iris and patchouli envelope the body with voluptuousness, before a delicious dry down of vanilla, tonka bean and woods leave a lasting signature. The lighter Dahlia Noir Eau de Toilette begins with a bright and juicy opening of mandarin, lemon and juicy peach, before a bouquet of rose in the heart is made more complex with wood notes and the piquancy of pink pepper. An enveloping dry down of vanilla, amber and musk romances the senses. Fancy grabbing either the Eau de Parfum or Eau de Toilette for yourself? Simply answer the question below and you’ll be in with a chance of winning. Competition closes on Sunday 2nd September. Good luck! Only one entry per person (based on IP address) will be counted. Automated entries will be disqualified from the prize draw. Entries will close at midnight on the Sunday 2nd September, and prize winners will be notified the following day. Two winners will be picked at random – one will receive the Eau de Parfum, and one will receive the Eau de Toilette – winner will have not choice as to which they receive. Escentual reserves the right to withdraw any nominations or votes if they feel they are abusing the competition or any of its rules. General Terms & Conditions apply. This entry was posted on Monday, August 20th, 2012 at 4:06 pm and is filed under Competitions, Fragrance, New products. You can follow any responses to this entry through the RSS 2.0 feed. You can skip to the end and leave a response. Pinging is currently not allowed. Looks lovely, what a lovely prize! I love perfume and these look Lush! Just the kind of pick me up I need . . . . A real classy treat! You just know this will smell wonderful.